There was just an easy way to shuffle the tabs on your browser. But I don’t see that simple feature to shuffle Windows Taskbar items. 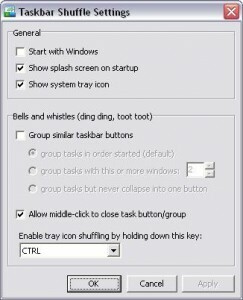 I was very much looking for a freeware which can help me to shuffle the items on the taskbar and found Taskbar Shuffle. Taskbar Shuffle is a simple freeware utility which will help you to move the taskbar items from one location to another for your ease of access. This will be definitely useful for people like me who opens a lot of windows at the same time. With the help of Taskbar Shuffle you can easily drag and drop your Windows taskbar items to rearrange them according to your preference. With Taskbar Shuffle you can easily reorder your tray icons also. You can also re-order tasks in a grouped button’s popup menu. You can use the middle-click shortcut to close programs present on your taskbar. When I tried it on my Vista laptop it was just using 2MB of RAM. Though Taskbar Shuffle might look like a simple tool you will find it really very useful at times. Samrat, thanks for sharing this tool. one quick question. from where do you get to know all these tools everyday? Is this tool virus, spyware and malware free? I asked this ? bcoz u have downloaded it from else where n using successfully. No offense pls. I installed it on my machine.. Nothing was shown here with Norton… Did u find anything?? O google me trouxe até aqui.. parabéns! How do you uninstall the thing once it’s installed??!! When I open up the control panel to “Remove Programs”, windows keeps telling me the program is running and I have to close it first to uninstall!